Setting up an enclosure for tree frogs is a fun process once you know the requirements of the particular species you’re housing. The main hassle comes from finding (and buying) all the different items you need; branches, plants, substrate, lighting, heating, thermometer, hygrometer, and more. The list of items you need only increases if you decide to do a vivarium setup. However you plan to do it, a kit can help alleviate the hassle of rounding up the basic supplies. And that’s precisely what we’re going to be looking at on this page; three great terrarium kits for tree frogs. It’s a “win-win” so to speak. You save time and money by buying a kit or “bundle” and the manufacturer sells more of their products in one sale. Unfortunately for tree frog owners, there aren’t many options in terms of full, complete kits. Currently, there are three kits that I know of; all of which offer different items at different prices. 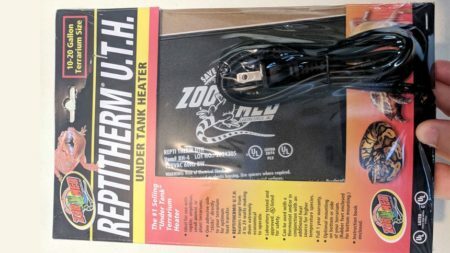 Also, depending on the species of arboreal amphibian you’re keeping, you may end up needing to buy a few more things like a heating device, lighting, decorations, etc. Anyway, I’m here to help you with this. I’ll review each of kit, share my likes and dislikes, and help you pick the best terrarium kit for your tree frog(s). It can’t tell you exactly what you will need without first knowing the species of tree frog you’re keeping. Each of them is unique to different parts of the world with varying climates and conditions; some are tropical while others can hibernate during the winter. You get the point, they’re all different. As such, their captive enclosure should match their natural habitat as much as possible. I will, however, go over a quick list of the basics. This should serve as a starting point. Tree frogs are arboreal, which means they spend most of their time in trees. Because of this, a vertical-style terrarium is recommended. Something taller than it is wide – or at least 18-inches in height. 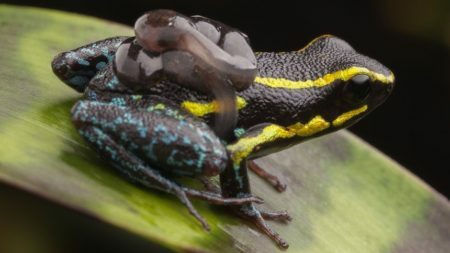 For frogs, a low powered UVB can be beneficial but they’re not always needed. They do need a constant day and night cycle, though. You may need a light to provide a day cycle if the terrarium is in a room with little or no light. A heating element may be required to keep your arboreal frog within a comfortable temperature range. Fake or live plants and branches should be added to provide plenty of climbing opportunities. A small, shallow water dish is needed. Your terrarium will need a substrate layer (something like ABG mix, coco fiber, etc). A thermometer/hygrometer is needed to monitor the temperature and humidity. This is a basic list. You may require more items especially if your tree frog requires a constant high-humidity. Other things include a stand for a heating lamp, lights, jungle vines, springtails and isopods (for vivarium builds), and more. So, let’s take a closer look at the three terrarium kits for and go over what they come with. Each one has a short, precise review with all the information you’ll need to help decide which one is right for you. One last thing; all of these kits are 12″ x 12″ x 18″ in size. That’s twelve inches in width, twelve inches in length, and eighteen inches in height. An enclosure of this size will typically hold 1 – 2 tree frogs but that depends on the size of the frog, of course. The Exo Terra kit is the only one that offers a bigger tank size (18″ x 18″ x 24″). An 18x18x24 tank will hold 3 – 4 adult tree frogs. Again, this all depends on the species you’re housing and how big they will become as adults. 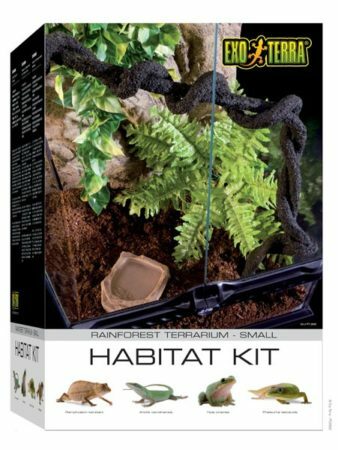 The Rainforest Habitat Kit from Exo Terra is a great starter kit for arboreal frogs. It includes many of the essential items. For some species, all you’ll need to do is set up the tank and place your pet inside. For others, not so much. Regardless, it’s a great kit to get you started. Before I list everything included in the kit, let me tell you about Exo Terra. In case you don’t know, Exo Terra is one of the top brands in the reptile and amphibian industry. They’re responsible for developing and selling some of the best equipment around. From UVA/UVB lights to foggers and everything in between. Their main product, in my opinion, is their terrariums. They have a great design which allows you to open the front of the tank. There is a latch which locks the doors when they’re shut. A nice ventilation system allows for airflow from the bottom to the top of the enclosure. Most of their terrariums come with a foam background that is designed to conceal cords and hoses behind it. This is perfect to hide the power cords and hoses which run waterfall features, foggers, and more. Now, let’s take a look at everything that is included in the rainforest habitat kit. This kit comes in a “small” or “medium” size. The small kit is 12″ x 12″ x 18″ and the medium kit is 18″ x 18″ x 24″. 3 plants – 2 with suction cups and 1 ground plant which has a base. “Compact Top” or “Hood” – This is where you can insert UVA/UVB lights. From what I understand, the lights are not included. You have to purchase them separately. Plantation soil (coco husk fiber) substrate. As you can see, this is a great starter kit. The only things it really lacks are the lights and a heating device. Not all tree frogs need a heating device but I do recommend a low powered UVB 2.0 light, even if you’re not growing live plants in the terrarium. 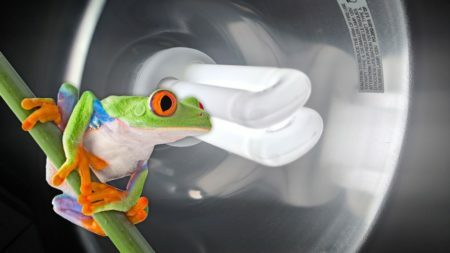 Just be sure to position the plants in such a way that your tree frog has several places to escape direct light. This kit can be hard to find in stores. I’ve never seen one at my local pet store but you can buy them online. The Tropical Vertical Kit from Zilla isn’t another great starter kit for most arboreal species. They’re really cheap and you can find them at virtually any pet store and online too. Zilla, like Exo Terra, manufactures a wide range of reptile and amphibian supplies. For this reason, it makes sense that Zilla would package several of their products into a kit and sell it at a reasonable price. 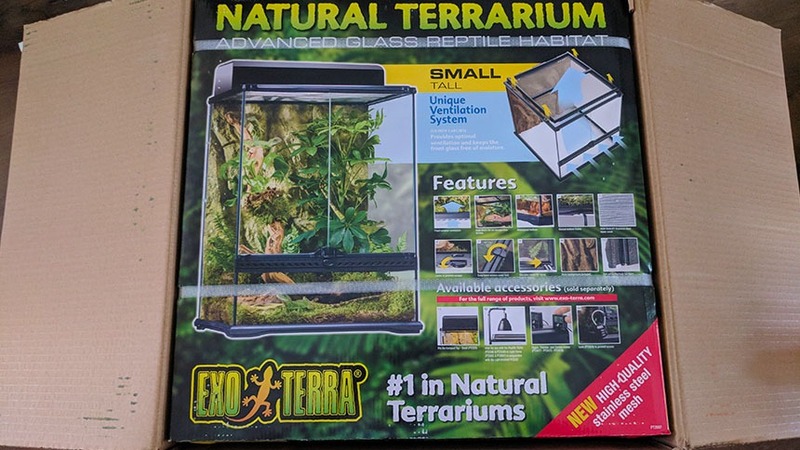 Zilla terrariums are similar to Exo Terra but with one small difference; the front opening is a single door rather than a double door. The front of the terrarium opens from the right side and it has a latch to keep the door locked when you’re not using it. This is a useful feature to have when it comes to setting up the enclosure, providing maintenance, and spot cleaning. 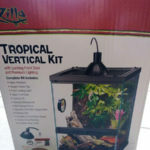 The Zilla Tropical Vertical Kit comes in one size – 12″ x 12″ x 18″. Mini-Halogen dome with a light bulb. From what I understand, the bulb it comes with is meant for light and heat. 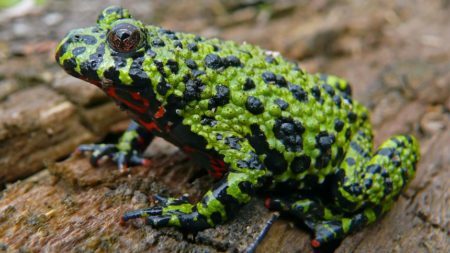 You might still need a small UVB light but that depends on the species of frog you’re keeping. This is a great kit, regardless. You’ll still need to buy some decorations. Items like branches, vines, plants, etc. Another thing to consider is that while the mini-dome light functions as a heater during the day, you might still need a heater at night (when the light is turned off). 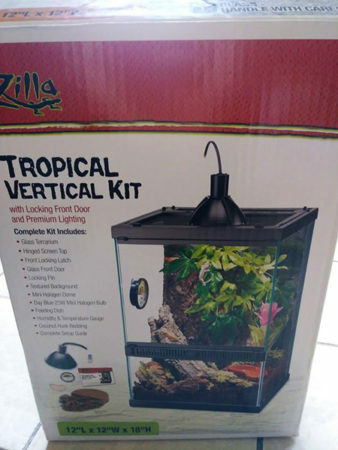 You can find Zilla Tropical Vertical Kits in most pet stores and online too. 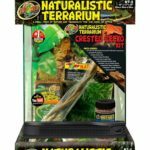 The Naturalistic Terrarium from Zoo Med is another kit that comes with the basic supplies you’ll need for a tree frog enclosure. Zoo Med makes a kit specifically for tree frogs but it’s hard to find, even online. Zoo Med is well-known by herpetologists world-wide. They develop tons of products for reptiles and amphibians; lights, water bowls, plant decorations, substrates, and, of course, terrariums. These terrariums have a single glass-door which opens from the right side. There is a latch which holds the door shut when you don’t need it open. They have nice, screen lids and provide lots of ventilation from the bottom to the top. One thing I want to point out is this; the kit we’re looking at now is made for a crested gecko. 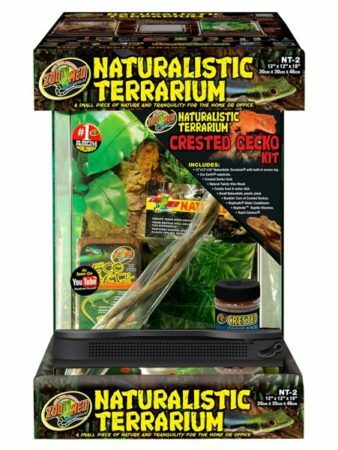 Zoo Med offers several different “Naturalistic Terrarium” kits, including a tree frog kit, but I wasn’t able to find it online or in my local pet store. Regardless, this kit will still work but it comes with some unnecessary items (crested gecko food & care guide). 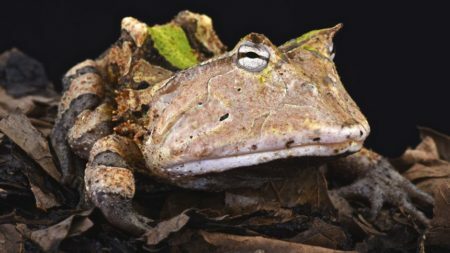 You won’t need a food dish because tree frogs eat live crickets mostly. But, on the other hand, the vitamins and calcium are great supplements for dusting the crickets before you feed them! Anyway, here are a few items you still might need; a heating element, a light, more decorations, branches, and a thermometer/hygrometer. The Naturalistic Terrarium kits from Zoo Med are awesome – if you can find the one you’re looking for. Unfortunately, there aren’t many options available online. If you’re interested in the tree frog kit, I recommend checking with your local pet store. While I think all three are great starter kits, the Exo Terra Rainforest Habitat Kit is my personal favorite. It’s my first choice and the one I recommend for now. It costs a few dollars more than the Zilla kit and less than the Zoo Med kit (depending on where you find it). It offers the most in terms of decorations. No, it doesn’t come with light bulbs but it does come with a hood, which is a good thing. Having a hood allows you to select which bulb you want and keeps you from purchasing a separate dome fixture. The vine provides added climbing opportunities for your arboreal pet and the terrarium itself is top-notch. 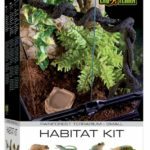 Sometimes you can find the Exo Terra Rainforest Habitat Kit on sale at Amazon (click here to check the current price). The Naturalistic terrarium kit from Zoo Med is a great option. The only problem seems to come from availability. Like I mentioned earlier, Zoo Med actually makes a tree frog kit but I was unable to find anywhere to buy one. For the time being, I’ve linked to the only Zoo Med Naturalistic terrarium kit I could find. As for the Zilla Vertical Tropical Kit? It’s been around for a long time because it is hugely popular and very useful. It’s a wonderful kit for a variety of arboreal species. Always remember to do ample research about your tree frog in order to know exactly what they require. Regardless of their needs, any one of the kits listed on this page will provide a great start for a tree frog enclosure.